I remembered the shock. A real 2+2=5 moment. I was 12 and on the cusp of some wild brain chemistry, and every emotion that registered felt especially intense. I was at the Red Robin by my house, and noticed something on the menu called the Royal Red Robin Burger. There was the beef patty, bacon, American cheese, and—what in the world?! A fried egg? All the synaptical wiring in my head tangled and frayed. Twenty-five years ago, the idea of a fried egg on a burger was fantastical. (Maybe heretical?) In the ensuing years, hamburgers weren’t just mere hamburgers, but a blank canvas for chefs to paint, often outside the lines. Elaborate two-handed sandwiches, tall as they were wide, were conceived, and no ingredients were off limits. I remember at the height of the gourmet burger craze, sometime around 2009, one chef made a hamburger with a slab of smoked pork belly and coleslaw on top. I didn’t know if it was a burger in the style of North Carolina barbecue, or North Carolina barbecue in the style of a burger. But there’s something about the fried egg-atop-burger that remains a notion Americans have not fully embraced. It is not a slam dunk accoutrement, like bacon and Cheddar or mushrooms and Swiss. It is divisive, and even among those in favor, it is few people’s favorite burger topping. Silver’s tweet compelled me to sit down and ponder the merits of serving a burger with a fried egg on top. On its face, the novelty is alluring, but is it just that—novel, and nothing more? Does it contribute anything, gastronomically? Press down on the bun. Like slurping a crawfish head or licking a yogurt lid, puncturing the yolk via bun compression is tactilely satisfying. When you do, watch it ooze, egg yolk lewdly spilling over the sides of the sandwich. The yellow against the char of the patty makes for an appealing visual contrast. The controlled spill feels very art school. Con: An egg adds minimal flavor. A hamburger requires brawny, robust toppings and condiments. Every flavor associated with a burger is loud: the beef, ketchup, mustard, onions, pickles. It must be a flavor that “screams.” The cooked egg whites? Forget about it. The yolk? Unless it’s the color of sunflower and comes from free-ranging hens that wander freely, the flavor of the egg yolk is likely nothing more than of a subdued richness. Think about it: What does an egg yolk really taste like? Can it be described in words? Is there an aroma to the yolk? Are we simply mistaking its luscious silken texture for an actual flavor? Ask yourself this: If you’re arguing a fried egg provides added flavor to hamburgers, would you too put scrambled eggs on a burger? 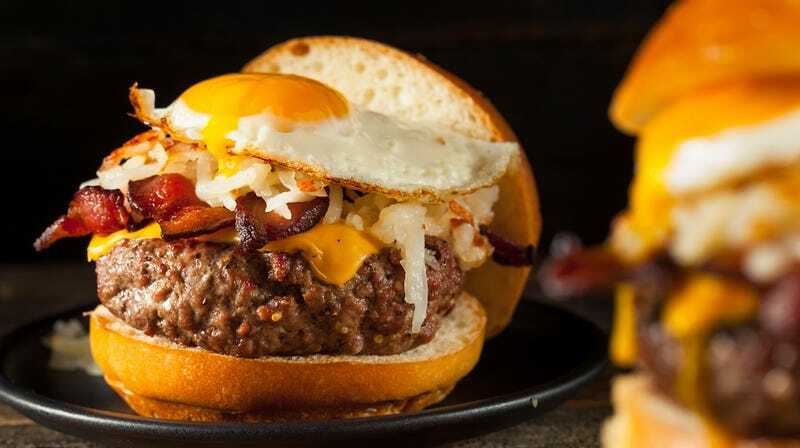 Pro: An egg augments the burger’s richness. This plays to my previous point. Yes, the yolk shellacks the sides of the burger with creaminess (lest we forget, we’re presuming the yolk isn’t cooked through). If texture is high on your list of burger importance, then that added fattiness enhances the indulgence effect. Though to be honest, that’s a lily not in need of gilding. The beef juices from the patty already provides enough fat, and there’s a good chance there’s a slather of mayo already. Is there such thing as too rich? An egg yolk seems superfluous in most cases, and risks being unnecessarily messy. Con: The egg yolk dulls the flavor of everything else. As mentioned above, egg yolk generally doesn’t taste very strongly. But what it does is act as a flavor duller for everything else. It’s like your fingertips trying to feel through latex gloves. Every time I’ve ordered a burger with an egg, the yolk would mask the beefiness. I might as well have ordered a fried egg sandwich. Ultimately, I now fall against serving burgers with a fried egg. That said, one of our favorite sayings at The Takeout is don’t yuck on another person’s yum. If fried eggs on burgers are your thing, please enjoy it forever. But a fried egg feels gaudy, more like a status symbol. My argument is simply there are stronger toppings for burgers that would yield greater satisfaction. Hell, I’d argue for slathering peanut butter on a hamburger before adding another fried egg.